Samuel Adams new New England IPA will soon be available in 16 ounce cans nationwide in April 2018. Has the haze craze officially jumped the shark? 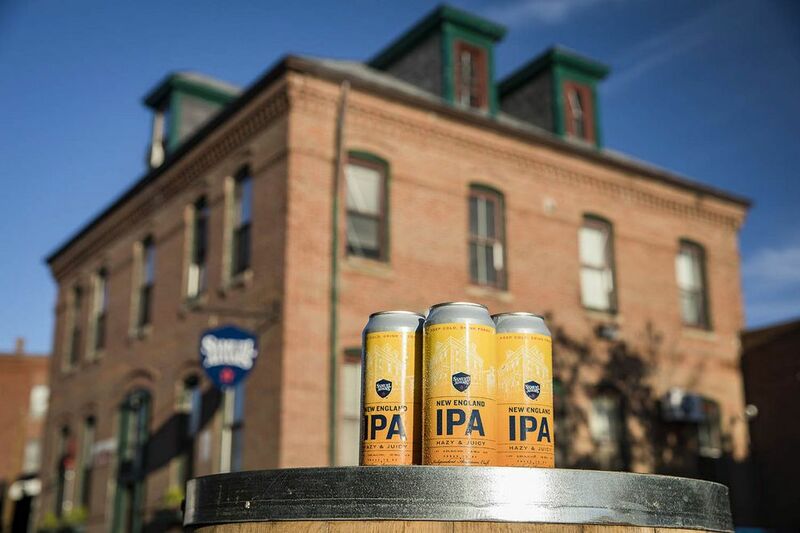 A few months back Sierra Nevada Brewing launched Hazy Little Thing IPA, now Samuel Adams, the largest craft brewer in all of the land, is set to launch its New England IPA. For those of you in the Boston area, Boston Beer Company has been brewing Samuel Adams New England IPA for the past few months. This new hazy IPA was developed in the brewer’s small brewery located in Boston, MA. According to the press release that was sent with a few samples of this beer, New England IPA was the top selling growler of 2017 at the brewery. Currently this new IPA is available nationwide on draft but come next month, 4 packs of 16-ounce cans will be available throughout Samuel Adams distribution footprint here in the U.S. Both the brewers and the marketing department at Samuel Adams felt the need to brew and package a beer that is causing a major shift in hoppy drinking habits across the country. 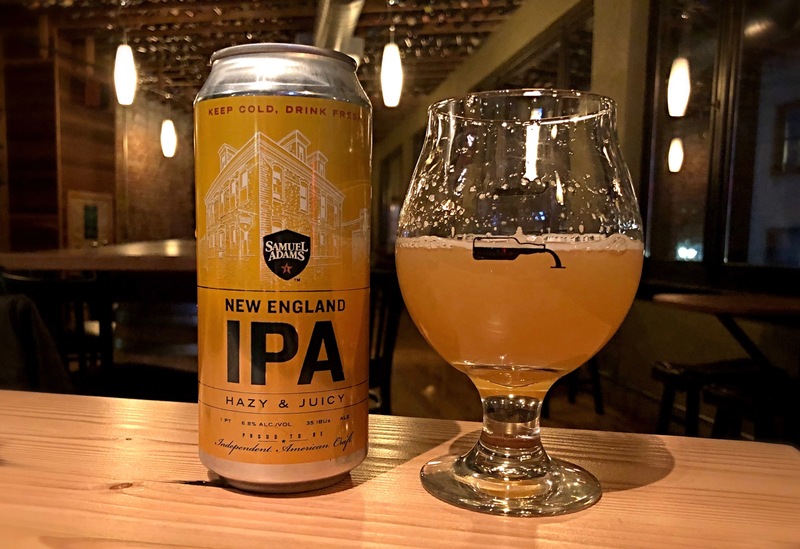 Upon looking at the can of New England IPA, it reveals a look that is similar to how many brewers are packaging this hazy, yet juicy style of IPA with a plain aluminum can and a stickered label. Upon closer inspection the 16-ounce can is actually a full printed aluminum can with a gap at the top to make this can look like the canned hazy IPA from your local craft brewery. But it’s what is on the inside of the can that elevates this juicy, hazy IPA. New England IPA is an unfiltered IPA that uses Mosaic, Citra, Galaxy, Simcoe and Cascade hops to create a juicy and hoppy, easy drinking IPA. Tropical fruit flavors, predominately of pineapple, shine through on this 6.8% ABV beer. The cans of New England IPA that were sent to us to sample varied slightly as the first can opened seemed to be a bit oxidized. That said this first can was not fully chilled. Our second can, fully chilled, did offer a much more pleasant experience, one expected from a major player such as Samuel Adams. The challenge facing this beer will be, as it is with other beers of this hazy style, shelf life. New England IPA is now available nationwide on draft. Beginning in April 2018, New England IPA will also be available in four-pack 16 oz. cans for a suggested retail price of $8.99 – $9.99. Since it’ll be rolled out nationally, just make sure to check the date codes on these cans as drinking these hazy IPAs fresh is the only way to go. To find where New England IPA is available near you, visit the Samuel Adams Beer Finder. New England IPA by Sam Adams is a very refreshing alternative to many of the others I frequently drink. I am am IPA exclusive beer drinker. The first time I tried it was a perfect summer day here in Fargo, ND. The local Buffalo Wild Wings had it featured on the large selection of tap beers. I enjoyed the fruit undertones and Especially the fresh flavor. It paired well with their version of the Cuban Sandwich. It is my new favorite IPA. I just picked up a 4 can pack of 16oz cans and I am savoring a can now. simply one of the cleanest IPA’s I have had. I love the rebel IPA but the N.E IPA is a nice summer outdoor beer easy to drink and lighter on the hops. smooth finish helps this drink become on of my favorites. I’m still waiting for it to hit store in PA.